This is a supporting image for the Old Satyrs on an Attic Red-Figure Bell Krater. This piece of pottery was made between 430-420 BCE. Just like the bell krater, it is also made out of terracotta and painted in the red-figure style. It was made during the classical period in Greece. 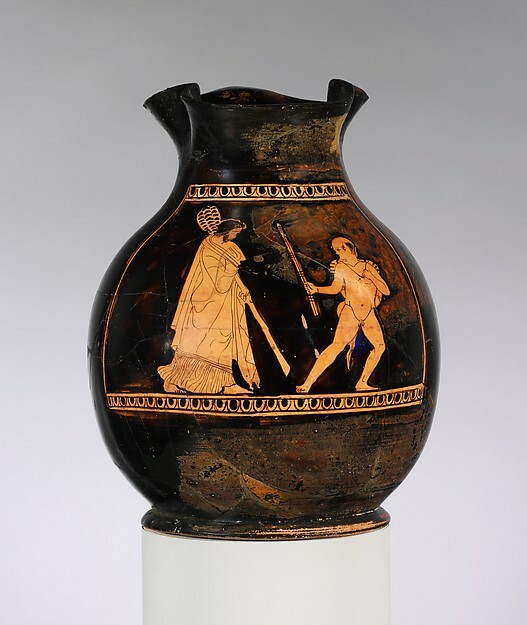 This piece, however, is not a bell krater but a chous, meaning “jug.” It stands 8-7/8″ high. This piece depicts Dionysus, the god of the grape harvest, wine making, and wine on the left hand side, draped in many cloths. Dionysus is walking toward the old satyr, depicted on the right. The old satyr looks as though he has a sack on his back attached around his neck and is wielding a torch, according to the Met Museum’s website.